Available in plain, checks , linning and stripes in set of 3 color matching , 6 color matching and 12 color matching in 1 design. Width available - 36" and 58" inches. Range starts from Rs 11 meter to Rs 48 in 36" width. and Rs 36 meter in 58" width. We can provide you plain dyed shirting in 100% fine cotton fabrics in a range of colors. We use mill made high quality grey fabrics and are dyed and processed at only the best process houses of India. We have fabrics in 60s cotton, 40s cotton, slub yarns, linen look etc. 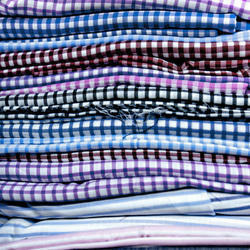 We are one of the leading manufacturers, suppliers and exporters of an exclusive range of Shirting. We offer Yarn Dyed Shirting Fabric to the clients. Useful for producing appealing shirts, our Yarn Dyed Shirting Fabric is high on demand. Moreover, the Yarn Dyed Shirting Fabric has smooth texture and high tear strength. 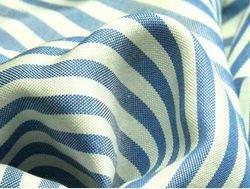 We are leading manufacture and exporter of Shirting which is made by high quality of Polyester with Dyed Yarn. This gives excellent quality of shirting to our prospective customers in various design and color patterns. We manufacture the best quality of dress material are less price.